America has rediscovered its states and their governments. After decades of dominance by the federal government, the balance of power is returning, often dramatically, to state governments. A devolution of authority began during the Reagan years, but recent Republican victories in Washington and in the states promise to accelerate the rate at which state governments assume greater responsibility for governing the nation. Inherent in that development is the sense that state governments, long perceived as the weakest link in American politics, are now perhaps the strongest.Here, David Hedge provides a comprehensive and up-to-date review of how states have evolved over the past several decades both on the demand side (citizen participation, elections, parties, interest groups) and the supply side (governors, legislatures, the courts) of state government. 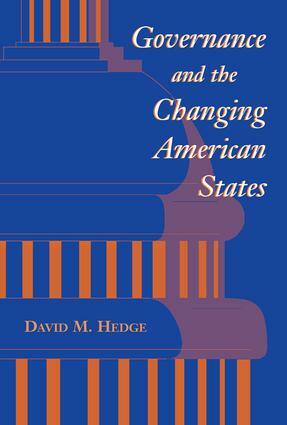 In addition to describing the kinds of changes that are occurring at the state level, Hedge looks at the impact of those developments on the quality of statehouse democracy and the ability of the states to govern effectively. The major theme of the text is that state governments in the nineties are better able to govern than ever before but suffer the same kinds of problems?inordinate interest group influence, partisanship, political stalemate?that we have seen at the federal level.Governance and the Changing American States offers students an important and timely framework for viewing and assessing these changes in state government in the context of recent research on the impact of changing state politics and governing.